Trustbusters are behaviors that erode trust among direct reports and colleagues. Some common examples are when we don’t demonstrate expertise in our jobs, and don’t achieve results which causes people to lose faith in our Ability. We also “bust trust” when we break confidences, tell lies of convenience, or gossip about others. This impacts our Believability. Another trustbuster is when we don’t listen. It’s hard sometimes to pay attention when we’re in conversation with people. Your mind starts to wander, or you find yourself thinking about the next meeting. When we don’t listen, or show interest in others, or recognize others, that erodes trust by eroding our Connection with people. Finally, as leaders we sometimes bust trust when we don’t follow through on commitments by being disorganized or unreliable which undermines people’s perception of our Dependability. How can you go about rebuilding broken trust? “The first thing is that we need to Acknowledge that there’s been a breach of trust,” says Conley. “It’s like they say in a twelve-step program, the first thing you have to do is acknowledge that you have a problem. You’ve got to acknowledge the situation exists. Trust is a very delicate thing that takes a significant amount of time to build and can be broken in just an instant. But it is possible to repair and rebuild trust. But you have to address it immediately. Don’t let a mistake in judgment turn into an indictment of character. Conley likes to quote a Chinese proverb to help leaders understand trust and timing. The proverb says that, “The best time to plant a tree is 20 years ago. The second best time is today.” Don’t let trust issues fester in your organization or in your relationships. Address them today. To learn more about Conley’s thoughts on improving trust—including the one behavior that all leaders can address immediately—read The Leader’s Role in Building Trust. June 20, 2011 in Best Practices, Communication, Relationships, Transparency, Trust. The process outlined is also a great tool to teach kids and young adults. In doing so it enables them to build integrity and respect amongst their peers and adults. Hi Greg–thanks for pointing out the applicability of this process beyond business leadership. I agree that it would be a good skill to learn early in life. 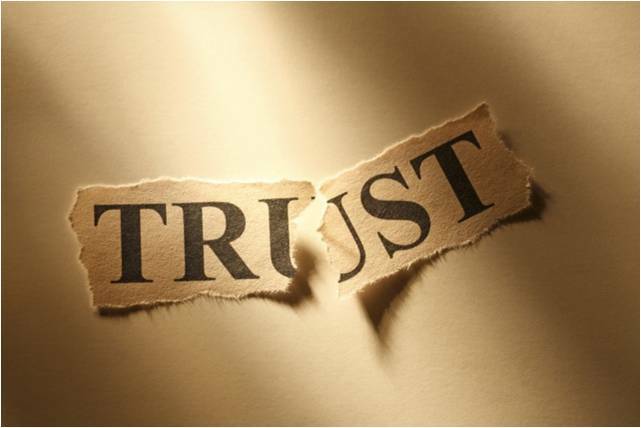 Trust is an important concept and we will all have a need to rebuild or repair relationships at some point most likely. Great insights here. Mistrust comes with an amazingly high cost, as we learned in Speed of Trust. I think the most under appreciated step mentioned is the apology. Someone can admit they were wrong about something, without genuinely apologizing. It’s so important for the integrity of the relationship sometime, that you stop and say Sorry…like you mean it. Thank you so much for this resource. You actually helped me figure out what I think has been going wrong in my career. I want to make it right with everyone who’s trust I broke, making light of their confidence in me. Reformation highway, here I come!!!! Hi Stella-I’m glad you found this information helpful. Good luck with the new direction–it’s never too late to get started. I know you’ll see a difference. Genius article. An employees loss of trust is in their manager is often the catalyst for dysfunctional turnover as it often leads to far worse things. Loss of trust in overall leadership, etc. Managers and senior leaders need to follow these tenants and be held accountable for these actions, but we often forget that companies have a responsibility to empower its leaders to action these promises. Hi Bryan–thanks for your comments. You make a great point that an organization’s culture has to allow the opportunity for leaders to Acknowledge, Admit, Apologize, Assess, and Agree. If a leader doesn’t work in an environment that encourages this, it can be especially difficult to engage in a new behavior like this. Hi.. IT SO TRUE.. BUT I HAVE A PROBLEM.. HOW AM I TO REBUILD THE TRUST IN A PERSON WHO HAD LOST ON ME.. AND THAT PERSON IS SO STRONG IN STAYING AWAY FROM ME.. HOW TO GET BACK THE PERSON WITH THE OLD TRUST?